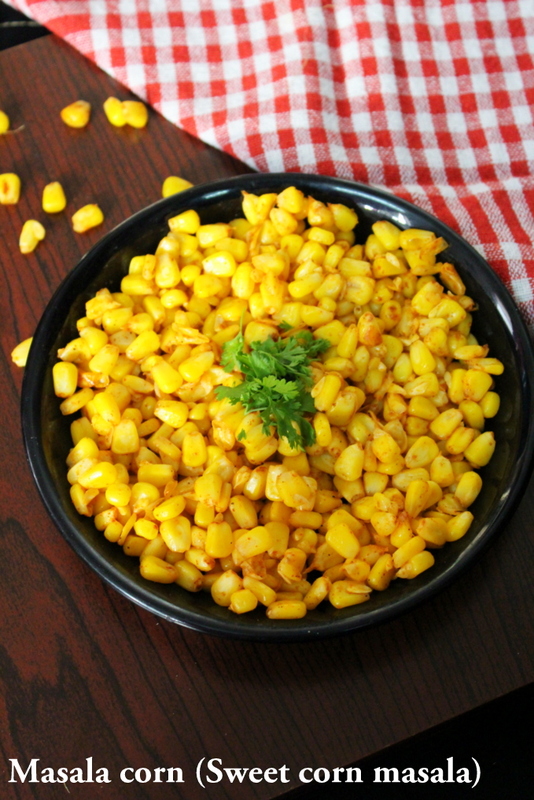 Masala corn, a very popular and a quick Indian street food recipe made using sweet corn kernels and some tangy flavored Indian spices. The taste of this corn masala is chatpata taste and there is a lot of difference in taste with different spices we add. Many of us variate it with our own spices mixing into the boiled corn kernels. 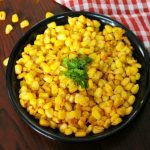 It is a very quick evening snack recipe and kids love sweet corn and a very healthy recipe that can be eaten by young and kids. To make this recipe, we need sweet corn which is very commonly found in India in monsoons and is also available in packets in most of the stores. If one uses a sweet corn with the peel, then one needs to have patience to remove the corn kernels and I have shared some of the techniques I use to remove them below. Remove the peel and boil the sweet corn by pressure cooking to 1 whistle. Take a spoon and loosen one row vertically and try to remove those kernels using fingers. Try to loosen row by row with a spoon and remove all the kernels using fingers and we need to have a little patience to remove them. Once all are removed, they are ready to be used. If one finds it hard to get it removed from the corn, then the sweet corn kernels are easily available in grocery stores which are available in packets and can be bought and used for cooking purpose. First method: The very simple way of making this quick snack is by boiling or pressure cooking the kernels in water for about 10-15 minutes, straining them out and then adding butter, salt to taste and pepper which gives us the recipe of street style way of making buttery sweet corn. To soften the corn we can use any of the techniques such as boiling, pressure cooking, steaming, or we can even soften it in oven. Second method: The other way is by making it in chaat form that is lots of spices, herbs, onions and tomatoes are added into it and made in the form of corn chaat. Masala corn: This is the method which I will be sharing it below in my recipe card…Do check out the recipe below. This sweet corn masala is served hot in every Indian street corners. I have experienced the taste of the masala corn a several times and is a very easy snack that can be made in our house holds easily. Eating this healthy snack once in a while is very beneficial for health since it is loaded with lots of vitamins, minerals, nutrients and also helps in proper digestion, for good vision, and prevents anaemia. If not used as a corn, then one can have it in the form of salads, chaats, use it in sabzi recipes and also make its soup and have it in a more healthy manner. To make this we need to have sweet corn handy or readily available sweet corn kernels which are available in every Indian grocery store. 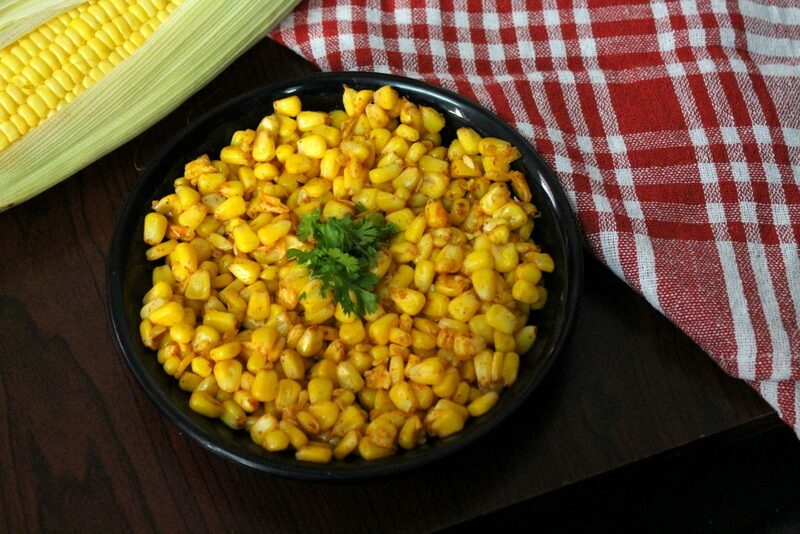 An easy to do quick snack recipe to be made at home with sweet corn kernels. Take a pressure cooker, add some water, add the sweet corn, cover the lid and pressure cook for 1 whistle. Reduce the steam, take the corn out and remove the sweet corn kernels from corn. Take a vessel, add water, add sweet corn and boil the corn for about 15 minutes to 20 minutes. Take it out carefully, remove the sweet corn and cool it down. Remove the corn kernels and they are ready to use. Add butter and melt it on low flame. Add the corn kernels into it and mix thoroughly for few seconds. Add the spices such as salt, black salt, pepper powder, chaat masala powder, red chilli powder, mix well. Mix thoroughly all the spices with the corn kernels. 1. If loose corn kernels are used then boil them in water or steam them for about 15 to 20 minutes. 2. If loose kernels are boiled in water, after boiling, just strain out the corn kernels and we will have hot boiled kernels into which we can directly add the melted butter, spices, mix well and served hot. 2. Do not add too much of red chilli pwoder as it may make the masala corn very spicy. Add the spices according to one's taste.